Woodbridge, United States - January 17, 2019 /MarketersMedia/ — First responders are the good people who are the first to respond to minor and major accidents and are usually Emergency Medical Technicians (EMTs), police offers, and firefighters. These individuals have partaken in specialized trained in providing urgent medical care to injured individuals and trauma victims. As such, they are well-versed in what constitutes a sufficiently equipped first aid kit. 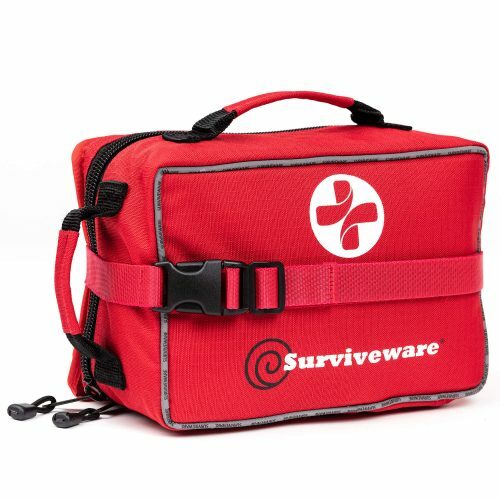 Leading adventure and safety gear retailer, Surviveware has recently released their Large First Aid Kit for home, office, and vehicle use, winning the recommendation of experienced first aid responders, rescuers, and EMTs. Surviveware’s Large First Aid Kit is designed to provide several life-saving supplies that can be used to treat minor and major injuries. Containing 200 pieces of medical provisions, this first aid kit holds essential items of safety and preparedness. The kit holds bandages, adhesives, conforming strips, gauze swabs, and non-adhesive dressings. Special first aid tools such as tweezers, splinter probes, a basic tourniquet, triangular bandages, nitrile gloves, and CPR kit are also included in the pack. This large first aid kit also contains an advanced first aid handbook that can be referenced during a large variety of emergencies. The first aid kit’s provisions are stored inside its 10” x 7.25” x 5” 600D polyester bag which protects the supplies. Since the fabric is waterproof, owners are assured that their provisions stay fresh. To further secure the supplies, Surviveware enclosed the medical items in resealable laminate pouches. These bags add another layer of protection to keep water and dirt from ruining the supplies. Surviveware’s Large First Aid Kit can be stored and carried using the MOLLE straps attached to the back of the kit. Through this innovative system, the kit can be strapped on a car’s headrest, roll bar or a rucksack, tent, or hammock. The kit can also be stored in cabinets and storage areas with ease. Some of Surviveware’s customers store their kits in their car’s trunk using the first aid pack’s Velcro side. In addition, the kit can also be carried conveniently by using the durable top handles. Get security with a first aid kit that receives the recommendation of a firefighter. Buy this large first aid kit today for an exclusive 20% discount today only. Take advantage of this limited time offer and grab your kit today by clicking here.